Includes spiders, finials, electrical parts, nuts, rods, and the like. The beautiful stained glass lampshade you have just created will benefit immensly if you will but perch it upon one of these serenely appropriate lamp bases. All of our lamp bases now include all electrical hardware, saving you the trouble of having to figure out what electrical parts you need and then risking electrocution by assembling it yourself. 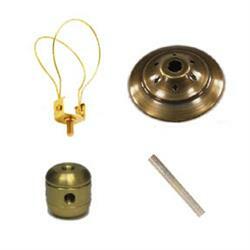 All bases are of zinc alloy, electrolytically finished in an antique bronze. Here we list unassembled electrical hardware kits you may use to mount your lampshade onto a suitable lamp base, or to hang it from a ceiling fixture. Most of the hardware is brass plated steel which can be darkened with our #7357 brass black. On the page called "Compatability Chart" we give recommendations for matching the accessory packages to the lamp bases.